D.A.M.N. 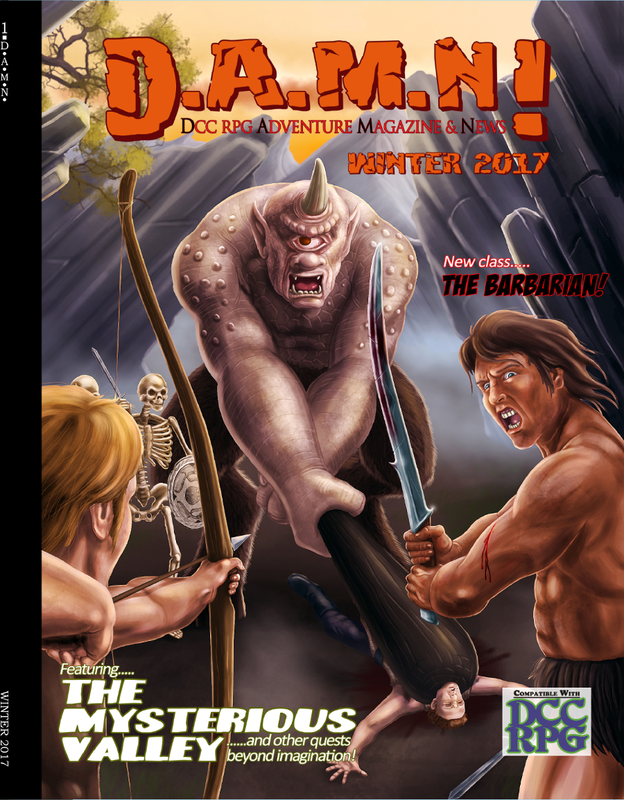 Magazine #1 - Winter 2017 was written by Daniel J. Bishop, Paul Wolfe, Stephen “Snake” Newton, Thorin Thompson, Garett Oliver, Julian Bernick, and Godric McKellan. Art is by David Fisher, Daniel J. Bishop, bygrinstow, Paul Wolfe, and Jordyn Boci. The publisher is Mystic Bull Games. Disclosure: I have writing credits in this product. In addition, I have an art and Contributing Editor credit. The initial concept for D.A.M.N. was created by Garett Oliver, who was at the time a player in my home group. I was part of the team, along with Paul Wolfe, David Fisher, and Rev. Dak J. Ultimak, who resurrected D.A.M.N. Thankfully, it wasn't I who had to steal this soul from Death’s hoary grasp. I do make a small amount from sales. So, here we are, at the end of one long journey, and at the beginning of another. D.A.M.N. is finally in print. It finally includes not only adventures, but actual news, as the "DCC Adventure Magazine and News" moniker intended. And it starts a new, and hopefully decades-spanning, journey into being more than a "one issue wonder". From the Damned Pit: This is a forward from the publisher, Paul Wolfe, about the journey we have taken and where the magazine is going. Paul is in error when he says that I have "basically written something for every DCC publisher", although I would like that to be true at some point. I have yet to bag Aleph Null Publishing, Barrel Rider Games, Black Arrow Press, Black Blade Publishing, Chapter 13 Press, Cognition Pressworks, Cut to the Chase Games, Death Machine Press, DIY RPG Productions, Fatbelly Press, Fireinthedust Productions, Forrest Aguirre, Freak Flag Press, The Hapless Henchman, Hydra Collective, IDD Company, Inner Ham, Kickassistan Ministry of Tourism, Kill It With Fire, Land of Phantoms (completely my fault here), Leviathan Publishing, Mount Parnassus Games, Order of the Quill, Other Selves, Owl Knight Publishing, Pacesetter Games & Simulations, People Them With Monsters, Phlogiston Books, Purple Sorcerer Games (again, entirely my fault), Steve Bean Games, Thick Skull Adventures, TSR Inc., or Zorathan City-State. There are a lot more people publishing DCC materials than you may think! News from Around the Fire: Things that are new in third party publishing. d14 Rumors and Reports: With some pictures of cultists. Crowdfunding News: Focuses on the upcoming Umerican Survival Guide by Reid San Filippo and others. Including some information on the stretch goals we can expect when the master of Crawling Under a Broken Moon starts his kick. There's some good stuff coming! Third Party Spotlight: Sky ov Crimson Flame: A preview of the upcoming 0-level funnel, Sky ov Crimson Flame, by Thorin Thompson (Owl Knight Publishing) and Blights ov the Eastern Forest, a 1-level mini-campaign that expands the surrounding environs. Third Party Spotlight: Dungeon Lord: An interview with Terra Frank. Forsaken Reavers of Praeder Peak! : Paul Wolfe's level 2-4 adventure from the original version of D.A.M.N., now with superior layout. Maps are also updated and improved. The Mysterious Valley: My hex crawl for any level. Layout is improved, but this is otherwise very much as in the original version of D.A.M.N.. There are lots of monster stats in this adventure, and many areas that the judge could expand. This was, to my knowledge, the first mini-campaign setting for Dungeon Crawl Classics. Effects of Extreme Spellburn: Stephen “Snake” Newton provides rules for making spellburn more costly...If you burn 3 or more points on a single spell, roll on the table provided. The more you burn, the bigger the die you roll. The Snow Queen: This level 4 adventure by Garett Oliver appeared in the original version of D.A.M.N., but the new release provided an opportunity to clean up some of the editing. In particular, the dragon at the end is now far more complete, and challenging! It’s All Greek to Me! : I provide some "Mythical Monsters From a Future Age". "Ages hence, the Daedalus Genetic Networking Group (DGNG) will merge computer technology, robotics, and designer genetics to recreate creatures from the Greek myths. When civilization collapses, these creatures will continue to dwell in the world, merging slowly with their demonic and supernatural counterparts." You get full write-ups for Cerberus, Charoninites, Ophiotaurus, Empousae, Erinyes, Eurayle, Ipotane, Lamia, and the Panes. Morningstar — Lord of Light and Knowledge: Author Julian Bernick provides information for clerics of the star-serpent Morningstar, including unique disapproval tables. It includes an inverted telling of the Garden of Eden story from the Biblical Genesis. The Barbarian: Once more, D.A.M.N. presents this warrior-inspired class by Godric McKellan. Sustaining Permanent Injuries: Not content to make spellburn more hazardous, Stephen “Snake” Newton provides a d24 table so that non-wizards can also "bear the tell-tale wounds of adventuring". Converting Material to DCC: My article from the original version of D.A.M.N., repackaged and with a better layout. Subscriptions and Submissions: You should read this part. D.A.M.N. is now a paying market.